T he Board spent a great deal of time discussing the impact of the Cedar fire on attendance at the Annual Meeting. As you know, we made the decision to postpone the meeting. We have chosen a new date and want you to know that the only reason we will cancel the meeting is if Show Low/Pinetop-Lakeside is under an evacuation order. We certainly hope there is not another fire, but it is the season. The new date for the Annual Meeting of the Members is Friday, July 22, 2016. Check in will be at 1:00 and the meeting will be held from 1:30 to 3:00. The location is the Hampton Inn & Suites at 1501 E. Woolford Road in Show Low. Delay of the meeting gives you another opportunity to send any questions that you would like to have addressed at the Annual Meeting to HOAMCO. Please submit them no later than close of business Monday, July 18, 2016. We cannot address issues involving your personal lot or account. We are obligated to address only general Association concerns. You may mail your question(s) to White Mountain Vacation Village, P.O. Box 4212, Show Low, AZ, 85902, email them to: swatson@hoamco.com or fax them to 928-537-1068. We will review your questions in advance and provide you with a quick response prior to the meeting. During the open forum, we will read the applicable questions and answers. If you have further questions that you did not submit, forms will be available for you to submit your question(s) and we will respond after the Annual Meeting. Lois Davis began her life in St. Paul, Minnesota. During the early years, Lois’s family ventured to Southern California and eventually settled in Phoenix when she was fourteen. She graduated from North High School and attended Phoenix College. Lois started her career with Valley National Bank in 1964, retiring in 2000. The majority of her career was spent with the Real Estate Department which evolved into Valley National Mortgage Company in 1981. The bank sent Lois to Pitzer College in California on a special women’s program to obtain her Bachelor of Science in Business Administration. She graduated in the 1990’s. Lois’s employment experience included mortgage servicing, mortgage production, secondary marketing which includes selling mortgages to investors, compliance with mortgage regulations, and computer systems. Valley National Bank, including the Mortgage Department, was merged with Bank One in 1992. As a result, mortgage headquarters was transferred to Indianapolis which changed the function in Phoenix. Her final experience included training loan officers to take mortgage applications on laptops including complying with all the mortgage regulations. This was her favorite position in her career because she met great loan officers wanting to do their best jobs helping people to improve their lifestyle through homeownership. This position also enabled Lois to meet people and see several sites around the United States. After retiring, Lois and her husband, Dave, spent their time traveling around Arizona and several other states in their RV. During this time they tried to find a place in Arizona to get out of the Glendale heat in the summer. Through one of Lois’s golf friends, they finally found the Village in 2006. They bought a lot the first day they visited the community. After forty-four years of marriage, Dave passed away in 2011. 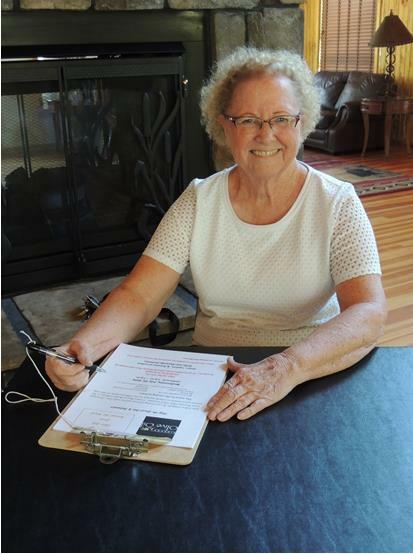 When the opportunity arose to volunteer for the Activities Committee, Lois decided to offer her time informing the owners of activities and important notices about the community. She loves her neighbors and participating in all the activities and trips. It is her favorite place in the summer and she enjoys helping with all the activities. Lois spends her spare time on the golf course, in the bowling alley, playing poker and cards, and helping her mother with her life activities. She also tries to be creative in making quilts for family and friends. The board has been discussing for two days whether or not to proceed with the Annual meeting scheduled for this Friday. We have been working hard on the agenda and are looking forward to meeting everyone. However, it seems “everyone” has dwindled to just a few. The smoke is a health hazard and people are on edge trying to deal with a pre-evacuation notice. From what we can determine, the majority of the Village has retreated to their winter abodes. The decision has been made to reschedule the meeting when more people are able to attend. We will let you know as soon as we are able to secure a new date. The poll was posted because we were not able to find anyone in the area who could repair the water fountain. Eight percent of respondents indicated they cannot live without it. It would be tragic to have someone succumb to thirst simply because over seventy-two percent don’t drink from the fountain and approaching twenty percent didn’t even know there was a fountain. The eight percent prompted us to do more research and a company was located that we believe can repair the fountain. If the repair is not successful, the board has made a decision to pursue a replacement or consider another course of action that would result in drinking water availability in the club house. Several alternatives have been suggested, including a bottled water system or a reverse osmosis system that could be plumbed off the existing water pipe. One resident even volunteered to look on eBay or Craig’s List to see if they could find a used water fountain. Several residents responded privately with their ideas and I would like to address those as well. A beer keg is not an option. The board would consider it if there weren’t so many choices. We don’t want to cause a fight over which beer is best. Also, a cistern is not a good choice as we don’t want everyone sharing a ladle. If you have other suggestions, please leave them in the comment section of this post as we may be considering this issue as we prepare the 2017 budget. As you are well aware, there has been a pre-evacuation notice issued that includes the Village. If evacuation is ordered, leaving as quickly as possible is in your best interest. Sheltering in place puts lots of strain on firefighters and other safety personnel. Here are a few ways to stay up-to-date on the fire. Please do not call 911 to get updates. It is being overwhelmed with inquiries and needs to be kept free for a real emergency. www.311info.net You can register for alerts on this site. Please gather all medications, important personal papers and anything you can’t live without. Have a plan for your pets. As an FYI, birds are highly susceptible to smoke. If an evacuation is ordered, please make sure your neighbors are aware as well. If you are going to evacuate to the Phoenix area, you will need to go through Payson as Highway 60 is closed. Be safe! Rodeo-Chediski from my back yard, a few hundred yards from the Village. It was the afternoon of June 18, 2002. 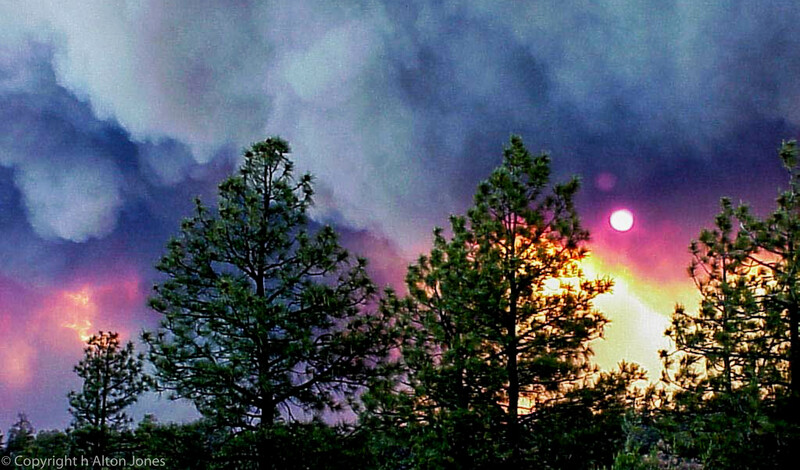 News was drifting in that a fire was burning on the White Mountain Apache Reservation. Twenty-four hours later, people living west of Show Low were evacuating. A day after that, Chediski was out of control. When the two met and became the “Monster”, it was an awesome and humbling experience. Believe me, you don’t want a repeat. It has been reported that conditions are ripe for a recurrence of Rodeo-Chediski. Most residents chose to own in the Village because they enjoy the beautiful pine trees. However, you can do your part to help reduce the threat to the Village by reducing any unnecessary fuel load on your property. Removing dead limbs on trees along with leaves and pine needles that have accumulated on the ground will go a long way toward helping. A representative from Timber Mesa Fire and Medical has indicated they were planning to do an evaluation of Village lots for potential fire risks. The last time they did this, they left door hangers where they determined a threat might exist, with suggestions for what to do to resolve (e.g. cut or trim trees). Some of these recommendations could fall within the purview of the Architectural Review Committee guidelines so please check them before you make a decision to remove an entire tree. Fire restrictions have been issued for the White Mountains. Dialing 311 will connect you to the hotline for specific restrictions. It’s time to be vigilant and alert. If you are cooking outdoors, please do not leave the grill unattended. When you are finished cooking, completely and properly extinguish the fire. Wildfires can begin unnoticed and spread quickly. If you notice smoke or flames, call 911 immediately. Have a safe and fire-free summer. An Amazon search for “adult flushable wipes” yields thirteen pages. It seems wipes are not just for babies anymore and everyone wants a piece of the action. Here are just a few brands; Cottonelle Fresh Care Flushable Wipes, Dynarex Flushable Adult Wipes, Hygea Flushable Wipes, Charmin Freshmates Flushable Wipes , Dude Wipes Flushable Single Moist Wipes. To be fair, there are other categories of wipes labeled flushable which include household cleaners, makeup removers, hand sanitizers, sunscreen applications and more. But are they really “flushable”? New York’s Department of Environmental Protection is spending an extra ten million dollars per year to process these so-called flushable cloths. This has become such a problem that several states are suing manufacturers to force them to remove the word flushable from their packaging and advertising. The season is upon us and many are enjoying their property in the Village. More are arriving daily, using and flushing their wipes, down the drain, out of sight, out of mind, and into the inner workings of the pumps in our lift station. Laboring under gobs of grease and balls of wipes, those poor, overworked pumps don’t stand a chance. So they work harder, valiantly sucking energy as they try to keep up with a flood of sewer nasties, while the foul water inches higher and higher. Once the pumps begin to vibrate and sputter, it is just a matter of time before blocked pipes and clogged filters bring them to a shuddering, grinding halt. The lift station has three pumps. One went down recently, reduced to a $6,000 pile of useless housing, impellers, seals and bearings. These pumps are not found on the shelves of the local plumbing store. They are a special order item taking months to produce. Because we are a pump down, the City of Show Low has notified us twice of high water alarms for the Village sewer just since May 18. When that happens, someone has to check it out immediately and remedy the problem. The Association is sent a bill for this “service”. In other words, you are paying for everyone who flushes wipes. It is always apparent what culprit is causing the alarm. In both cases, it was flushable wipes. This is going to be an expensive summer if residents don’t throw these sinister little wipes in the garbage can. It’s a habit, but studies have shown that habits can be broken. As an alternative, one of the retired engineers in the Village has suggested we add Imodium to the water tank. So save the constipation and save our sewer by thinking before throwing those wipes in the toilet. Thanks.